John Cena could replace Corbin! After producing a very good episode a week prior, Monday Night Raw couldn't keep the momentum going last week and delivered another disappointing show. While it wasn't a good episode, it did keep the build-up for WrestleMania 35 at a steady pace. 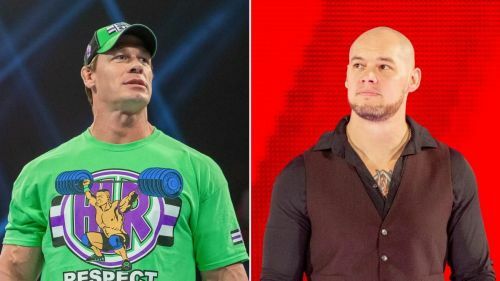 On one side, Kurt Angle announced that he would wrestle Baron Corbin in the final match of his career while on another, Brock Lesnar appeared in the opening segment to promote his match with Seth Rollins. The episode also saw Drew McIntyre demanding a match against Roman Reigns at the Grandest Stage of Them All. The biggest question that strikes now is what will the WWE have in store for us in this upcoming episode? Here are the 3 biggest shockers WWE could be planning for Monday Night Raw. Trish and Lita had a good showing at Evolution! Sasha Banks and Bayley made history together when they won the inaugural Women's tag-team championship at the Elimination Chamber pay-per-view by defeating five other teams in the Chamber match. The duo stated that the Women's tag team titles will be the only titles on the roster that the champions will defend across both Raw and SmackDown Live. As a result, they appeared on Smackdown Live this week in search of credible challengers heading into the Grandest Stage of Them All. There are only two weeks left for the biggest PPV of the year and its still not clear that who will challenge Sasha Banks and Bayley at the biggest stage. Considering the current situation, it looks like the Boss N' Hug Connection might defend their belts against multiple opponents and since Beth Phoenix and Natalya are already looking like one of the teams, WWE might throw another legendary duo into the mix. Enter Trish Stratus and Lita. Trish and Lita proved that they’ve still got it inside the ring when they went against Mickie James and Alicia Fox at the Evolution PPV last year. Since the rumours of an apparent match between the two teams have been swirling for sometimes and Lita has also desired to compete in the division if the opportunity came, Trish and Lita would be an ideal opponent to face the tag-team champions at the Grandest Stage of Them All.